Aboudia, ‘Djoly Du Mogoba’ (Diptych), 2011, Acrylic and mixed media on canvas, 176 x 237cm (each canvas), Courtesy Jack Bell Gallery. This essay is published on Africanah edited by Rob Perrée (date of publication 8 May 2014). Pangaea: New Art from Africa and Latin America, at the Saatchi Gallery, runs through to 31 August 2014. The group exhibition Pangaea: New Art from Africa and Latin America, at the Saatchi Gallery, includes a room of paintings by the Ivorian artist Aboudia Abdoulaye Diarrassouba (also known as Aboudia). Aboudia’s acrylic and mixed-media works, at times monumental in scale, brings painting into its historical relationship with the political. This relation is well-documented (I am thinking, for example, of Picasso’s ‘Guernica’ or Diego Rivera’s murals). 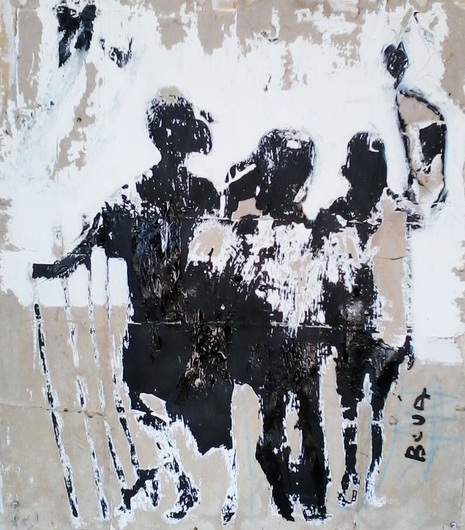 The Ivorian crisis of 2010/11 – erupting into a civil war, around the 2010 presidential election – is a significant aspect of Aboudia’s subject-matter. Abidjan, the city where Aboudia was born in 1983, was under siege. A text published on the website of the artist’s London gallery, Jack Bell, notes: ‘During this period the artist took refuge in a basement studio and began a body of work responding to the horrors of the country’s devastating political situation’. This extract reminds me of Griselda Pollock’s work on art and trauma, and her suggestion that artists might be conceived of ‘as participants in and sensors for our life-worlds and troubled histories’. Two large-scale acrylic and mixed-media paintings, at the Saatchi Gallery, imagine a dialogue with the recent Ivorian crisis. Both works are dated 2011 and titled ‘Djoly du Mogoba’ and ‘Le Couloir de la Mort’ respectively. The paintings suggest the affective experience of political violence, and visceral terror. In ‘Djoly du Mogoba’ reddened human skulls peer disconcertingly through a line of figures (their apparel and weapons signifiers of the military). Violence is embodied by the work itself: corporeal vulnerability and decay are present in the raw layering of acrylic paint, and scratched surfaces. Paint drips – like blood or sweat – down the faces of Aboudia’s characteristically cartoonish and ghoulish figures. In ‘Le Couloir de la Mort’ human skulls and spectral figures emerge (in varying registers of visibility and invisibility) out of an overwhelming darkness. Aboudia’s figures, reminiscent of cartoon strips, and crayon drawings, read as satirical: the language he deploys is at once benign and funny, and unsettling and threatening. The imagined boundaries between living and dead are blurred in the uncanny sensations of hollow stares and toothy grins; all the more unnerving for the cartoon-like rendering. Aboudia, ‘Le Couloir de la Mort’, 2011, Acrylic and mixed media on canvas, 180 x 400cm, Courtesy Jack Bell Gallery. Aboudia’s work is likened to that of Jean-Michel Basquiat and there are indeed visual connections to be made between the practices of these artists (the urban vocabularies of graffiti; crayon-like marks and brush-strokes; cartoonish figures and the use of text). In ‘Djoly du Mogoba’ lettering is scrawled across the length of the work, and (on a smaller scale) on details such as the helmets of the row of soldiers. Basquiat travelled to Abidjan in August 1986: this journey is documented in Phillipe Lacôte’s short film To Repel Ghosts (in 1986, the year of his journey, Basquiat completed the painting after which the 2013 film is named). The affects attached to death and haunting are often invoked in relation to art practices emerging out of conditions of trauma and political violence; and are important to a reading of both ‘Djoly du Mogoba’ and ‘Le Couloir de la Mort’. An idea of trauma shaped by a vocabulary of haunting is suggested by these paintings, the significance of which can extend to many other experiences of war. Dominick La Capra remarks: ‘there is an important sense in which the after effects – the hauntingly possessive ghosts – of traumatic events are not fully owned by anyone and, in various ways, affect everyone’ . My critique of Pangaea as a curated project is due to be published in the forthcoming edition of the magazine Art South Africa. I took issue with the exhibition’s exclusion of women artists, and its troubling conflation of Africa and Latin America (subsumed into the prehistoric landmass imagined as Pangaea). The subtext of the exhibition is also its relationship to a particularly London-centric art market invested in tidy, consumable geographical categories: thus the emphasis on Africa and Latin America. Pangaea includes artists whose work appeared on the inaugural London Contemporary African Art Fair 1:54 in 2013: Aboudia is one example. Of course, I appreciate the pragmatics of economic survival, and an infrastructure that supports artists; and the dealers, curators and critics that contribute to making their work visible, and legible. But I am wary of the kind of curating unattuned (whether naively or not) to the ethics and politics of art as a field of production and inquiry. There are vast postcolonial bodies of knowledge which draw attention to the political and ethical stakes of staging exhibitions about African Art in the West. Pangaea, its prehistoric name taking on other resonances, appears disconnected from the present, and the critical legacy of the postcolonial. To subsume politically engaged art into a consumable product detached from context is problematic on many levels. Exhibitions such as Pangaea (at museum-quality sites such as the Saatchi Gallery) do, despite the questions that they raise, play an important role. They introduce the work of artists to publics who may not otherwise have an opportunity to reflect on practices outside of their immediate experience. Having followed the work of Aboudia at the Jack Bell Gallery I enjoyed having the opportunity to focus in on his work more closely at the Saatchi exhibition. Aboudia is a younger generation of artist to emerge out of the Ivory Coast; and his work may prompt researchers to consider art practices within the historical context of this region. There are also connections to be made between Aboudia’s work and that of his contemporaries, for instance, Armand Boua who was also born in Abidjan (in 1978) and lives and works there. Aboudia now lives and works between Abidjan and New York. Boua similarly works with acrylic paint and mixed media; and is also concerned with the civil war and its aftermath. Works exhibited at the Jack Bell Gallery (21-17 April this year) engage the social: the question of children in times of war and subsequent loss and displacement. The exhibition, titled ‘Enfants de la Rue’, focused on street children. 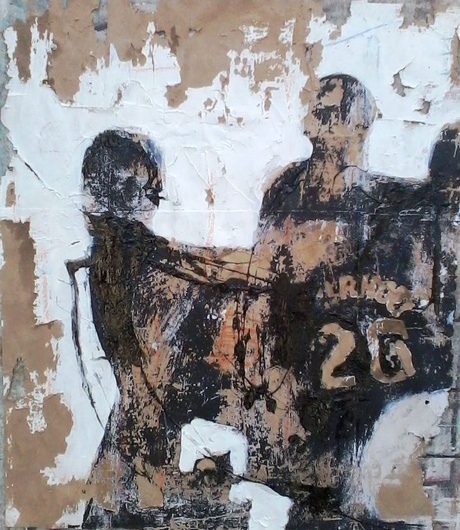 Armand Boua, ‘Untitled’, (From the exhibition ‘Enfants de la Rue’, 2014), 2014, Tar and Acrylic on cardboard, 82 x 95cm, Courtesy Jack Bell Gallery. The aftermath of violence, displacement, and the fragile bonds formed by the children themselves (in conditions of trauma), are embedded in the fabric of Boua’s work. He appropriates cardboard, used by the children for the construction of makeshift shelters. The material of the cardboard, upon which Boua maps out acrylic and black tar figures, registers (poetically and poignantly) human subjects on the margins of experience. The material itself (its skin) is worn and peeling: scarred by marks, holes and tears. The cardboard is a discarded, throwaway substance re-imagined by both the street children constructing ephemeral shelters; and the artist himself. The bodies of Boua’s subjects are suggested but never clearly articulated; as if to draw attention to their anonymity and invisibility at the edges of the social. The black tar, in my imagination, produces associations with city streets, and substances such as ‘black tar’ heroin. My memories of street children, in Johannesburg, and the effects of their visible consumption of damaging substances merge with this work as I look. ‘Enfants de la Rue’ is significant beyond Boua’s immediate geography. Similarly to Aboudia, Boua’s surfaces embody trauma: layering, stripping, scratching, and tearing characterise the work. The work of artists such as Aboudia and Boua opens up interesting questions for art history, curating and criticism: focused on the idea of the contemporary and the African continent. I am concerned, not in refracting the work of these artists through a western art historical, curatorial and critical canon (broadly speaking). Rather I am interested in the practice of paying attention to the artist’s particular relationship to medium, process and place, and the conditions from which the work emerges (historical, social, economic, and political). Of course, the world does not function in terms of rigid geographical binaries and borders (this is commonplace). The imagining of an oppositional relationship between ‘Africa’ and ‘the west’ is reductive. It is critically and ethically untenable to collapse the work of artists into vague geographical categories such as Africa (or imaginary configurations such as ‘Pangaea’). No matter where the historian, critic or curator is located, this work cannot be engaged from the perspective of a historically freighted gaze that is not self-reflexive. Warder, R (ed.) Pangaea: New art from Africa and Latin America [exhibition catalogue] with an introduction by Gabriela Salgado. London: Saatchi Gallery, 2014. Aboudia on the Jack Bell Gallery website: http://www.jackbellgallery.com/artists/27-Aboudia/overview/ [last accessed 1 May 2014]. Pollock, G. After-affects/After-images: Trauma and aesthetic transformation in the virtual feminist museum, Manchester and New York: Manchester University Press, 2013 (from the opening of the Preface). La Capra, Dominick. Writing History, Writing Trauma. Baltimore and London: The John Hopkins University Press, 2001, p.xi. This entry was posted in Essay and tagged Abidjan, Aboudia, Affect, Armand Boua, History, Ivory Coast, Jean-Michel Basquiat, Painting, Trauma, Violence. Bookmark the permalink. Looking at Jack Bell Gallery’s website they do not represent a single female artist. Sadly further evidence the problem continues to be larger than just the choices of curators – an art market still dominated by the tastes of (white, wealthy) men.